Got up at 7:30 a.m., dressed with the same wet clothes and wet shoes, took breakfast and proceeded on my journey of inspection of the front. We drove South to Mariveles, and went to the camp of Philippine Army Headquarters ten kilometers north of Mariveles hidden under a forest. I talked to the officers who met me at the road. As I was talking with them 3 Japanese planes arrived and flew over us. We ordered all officers and men to remain quiet under the trees so as not to attract their attention. 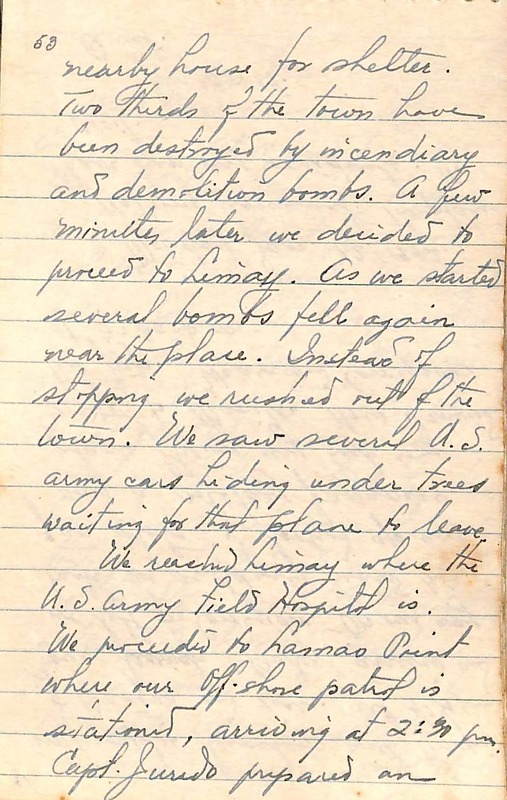 A few minutes later we heard the Anti-aircraft guns in action in Mariveles, followed by the explosions of the bombs dropped there. Half an hour later, I proceeded. I visited the Command Post of Colonel Castañeda in the interior of the forest. 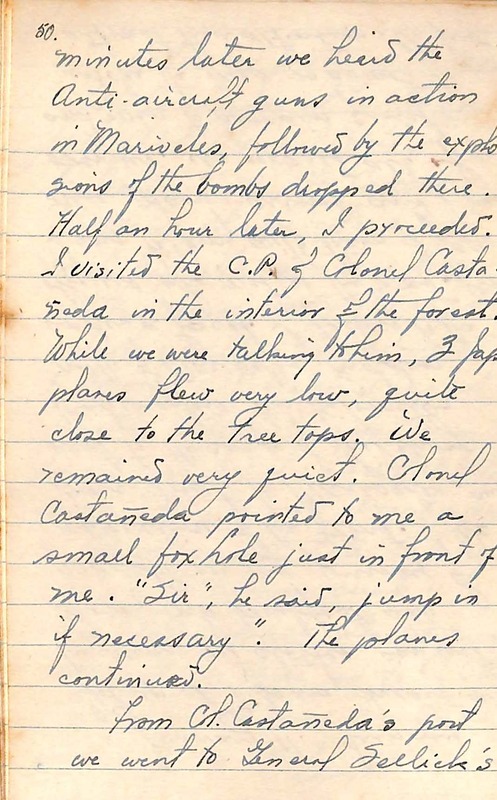 While we were talking to him, 3 Japanese planes flew very low, quite close to the tree tops. We remained very quiet. 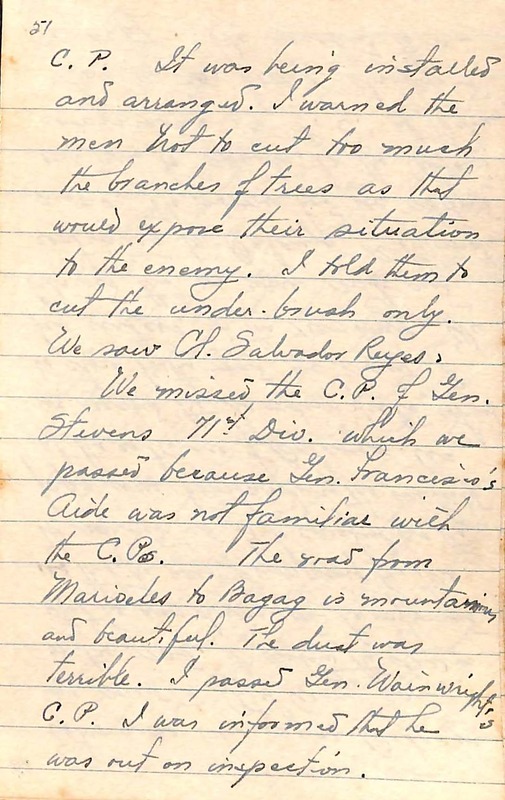 Colonel Castañeda pointed out a small foxhole to me just in front of me. “Sir”, he said, “jump in if necessary”. The planes continued. From Colonel Castañeda’s post we went to General Selleck’s Command Post. It was being installed and arranged. I warned the men not to cut too many branches from the trees as that would expose their situation to the enemy. I told them to cut the under-brush only. We saw Colonel Salvador Reyes. 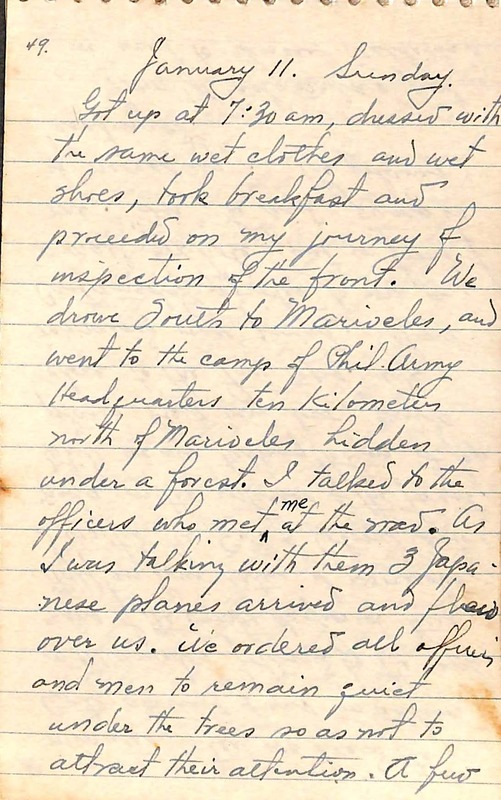 We missed the Command Post of General Steven’s 71st Division which we passed because General Francisco’s aide was not familiar with the Command Post. The road from Mariveles to Bagac is mountainous and beautiful. The dust was terrible. I passed General Wainwright’s Command Post. I was informed that he was out on inspection. When we were near Balanga we saw a Philippine Army car on the road. I asked the driver what he was doing and he informed us that he was pumping his tire. 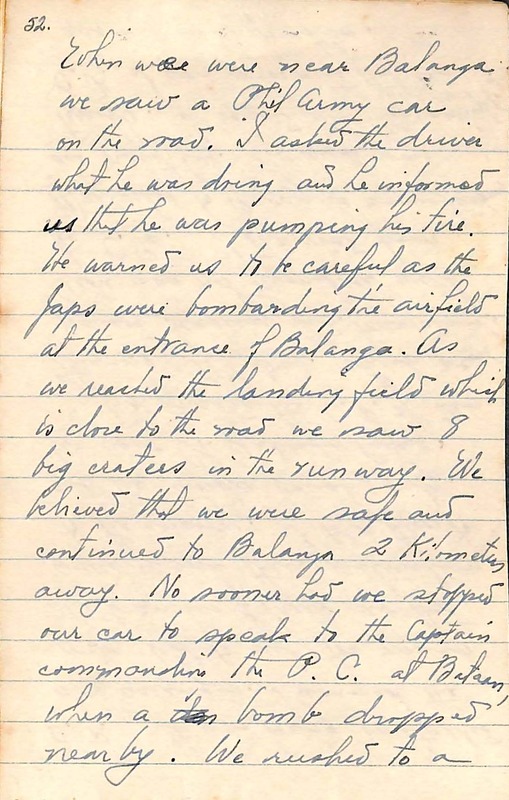 He warned us to be careful as the Japanese were bombarding the airfield at the entrance of Balanga. As we reached the landing field which is close to the road we saw eight big craters in the runway. We believed that we were safe and continued to Balanga two kilometers away. No sooner had we stopped our car to speak to the Captain commanding the Philippine Constabulary at Bataan, when a bomb dropped nearby. We rushed to a nearby house for shelter. Two thirds of the town has been destroyed by incendiary and demolition bombs. A few minutes later we decided to proceed to Limay. As we started, several bombs fell again near the place. Instead of stopping we rushed out of the town. We saw several U.S. army cars hiding under trees waiting for that plane to leave. We reached Limay where the U.S. Army Field Hospital is. We proceeded to Lamao Point where our off-shore patrol is stationed, arriving at 2:30 p.m. Captain Jurado prepared an impromptu luncheon with tinapa of Bangus and rice. At 4:30 p.m. our launch Baler arrived and we left for Corregidor. On our way back we suddenly heard Anti Aircraft gun shots. I looked up and saw a solitary Japanese plane flying very high en route to Manila. How I envied that Japanese pilot. We arrived Corregidor at 5:30 p.m. I was privileged today, Rizal Day, to witness the oath-taking ceremony, for their 2nd term of Pres. Quezon and VP Osmeña before Chief Justice Jose Abad Santos outside the Corregidor Tunnel entrance. It was a solemn but brave ceremony for only yesterday, Corregidor was bombed by 54 enemy planes for an hour before noon and some of the craters are visible from where we sat. Quezon’s Yacht “Casiana” anchored off North Wharf was a direct hit and sunk but the Philippine flag still flies from her mast above water. I was caught halfway on my way to the Tunnel, jumped to a ditch, endured an hour of bombings with those scary hissing sounds. I was badly shaken by the experience with many killed or wounded in the area where I was. Quezon made a stirring speech exhorting our people to fight the invaders. Aside from the Quezon family, the MacArthurs and the Sayres, among those I saw in the ceremony were: Lt. Col. Andres Soriano, Majors Carlos Romulo & Sid Huff; Capts. Jess Villamor, S. P. Lopez & J. B. Magluyan; Lts. F. Isidoro, L. M. Guerrero, N. Reyes, B. Cabangbang, & A. Aranzaso. After the ceremony, I ordered my crew to retrive the Phil. flag still flying on the mast of the sunken “Casiana” because Pres. Quezon expressed a desire to have it. While near the “Casiana” I noticed her auxiliary boat “Baler” under water. I decided to salvage the boat, towed it to Lamao and suggested to Capt. Magluyan who was with me to have it fixed to augment the “Danday.” Magluyan is one of the Lamao Beach Defenders in Bataan under Capt. Jurado, C.,OSP. C.,OSP conscripted a 40 ft boat, armed her with two .30 Cal. MGs christened “Danday”, Mrs. Jurado’s namesake, for use by the OSP Lamao Beach Defenders of Bataan. Today my ExO, Lt. Abraham ‘Abe’ Campo (USNA ’40) was rel’d. to be CO, “Danday” and to replace Lt. Campo, I selected Lt. Manuel Gomez ’41, my former classmate at MIT before we entered PMA. The bulk of OSP shore personnel transferred to Lamao, Bataan after Manila was declared Open City three days ago and so the beach defense of Lamao eastern Bataan becomes an OSP responsibility. The 1st Q-Boat Squadron found a suitable place called Sisiman Cove east of Mariveles Bay that conceals our boats from the air. One mile up Sisiman River is our Support Gp. –Engineering under Lt. Jose Zulueta; Torpedoes, Depth Charges, Ordnance under Chief William Mooney, USNR; Adm., under Lt. Carlos J. Albert (USNA ’39). Since Christmas, our mission is primarily ferrying VIPs from Manila to Corregidor, the seat of government. Today, all PAAC planes are gone. The planeless PAAC is organized as PAAC Provincial Regiment that is proceeding to Bataan. My province mates Capts. Pelagio Cruz and Eustacio Onrobia as well as my classmate Lt. Vic Osias are among with this Regiment. Also, the 700 PAAC Cadets were organized as an Infantry Battalion under Maj. Jose Francisco (USNA ’31) and proceeding to Corregidor. My classmates Lts. Bartolome Cabangbang and Alberto Aranzaso are among this Battalion. The Jap invasion forces from Lingayen Gulf and Lamon Bay are slowly advancing towards Manila. They have to fight every inch of ground despite their air superiority. And if you think our situation is bad, Hongkong is worst. It was a sad christmas for the British in Hongkong. The British garrison retreated to Kowloon but after intense bombings for three days Gov. Sir Mark Young of Hongkong gave up easily and surrendered to Japanese Gen. Sakai on Christmas Day. 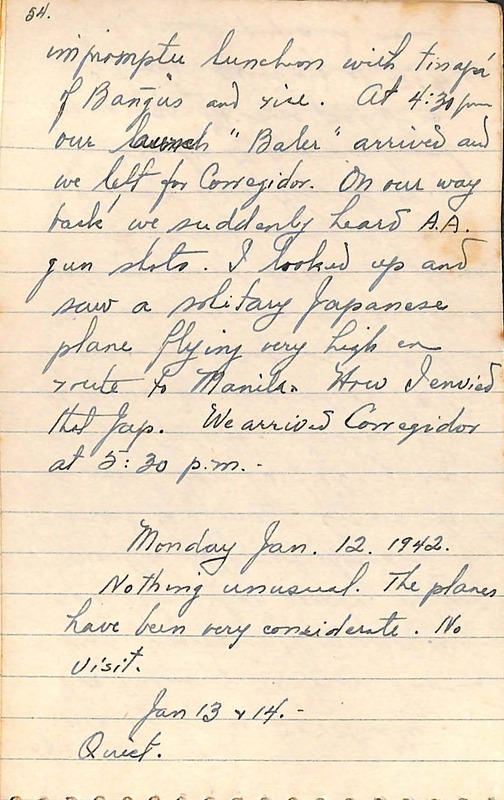 Japanese landings in Legaspi and Davao reported. Ft. Wint and Olongapo also bombed. I am saddened when my boss and idol Maj. Andrada USNA ’30 turned over his OSP command on orders of Gen. MacArthur two days ago to his ExO Captain Enrique L. Jurado USNA ’34. I thought Andrada’s relief is unfortunate. He placed the Q-Boats on war footing last Nov. 27 on his initiative. His new assignment is as Ft. Wint Comdr. The Q-Boat Squadron is assigned to patrol inside Manila Bay waters while PT RON 3, the China Sea Approaches to Corregidor and assist the Harbor Defense Command of Gen. Moore. The approaches to Manila Bay west of Corregidor are mined. A narrow channel serves as entrance and exit to Manila Bay an one of the PT jobs is to guide those vessels not familiar with that channel. During the Japanese landings in Northern Luzon, Capt. Colin Kelly of the FEAF is credited with bombing and sinking an enemy battleship. He was killed after his plane was shot down. Pres. Roosevelt promised that Capt. Kelly’s one year old son will be eligible to enter West Point when he comes of age, his Dad’s alma mater.